Cata and Miguel said “yes” in an October day where good weather was always present, with a mild temperature and a summer-like warm air. Without a doubt, a privilege that can only be found in Majorca and the Mediterranean. The couple began their married life in the best possible way: with good weather, nearby their dearest ones and in a fascinating setting. And, of course, with the highest level catering to enjoy those delicious flavours in such an awaited day. The banquet was celebrated in the spectacular estate of Son Mir, whose people in charge cared for the slightest detail so everything went perfectly. 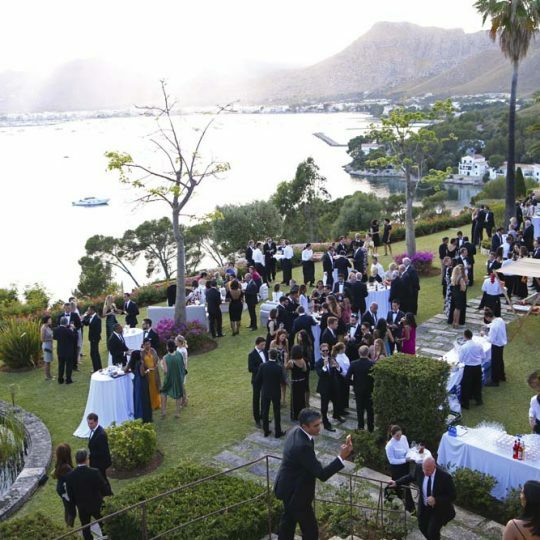 In the estate’s gardens, soft jazz tunes received their relatives and friends, who gradually arrived as the night fell. Some original soap bubbles levitated in the air, offering a magical and special feeling, and just in the middle of the gardens, two big shiny letters, M and C, the newly-weds’ first initials. Undoubtedly, a dream environment and a fantastic presentation. Marc Fosh Catering’s proposal deserves a special mention. For this occasion, they offered some delicious and varied canapés including an original reinterpretation of gazpacho, using tomatoes with strawberries and mango; prawn skewers and melon with curry oil; goat cheese croquettes, honey and truffle; lamb mini-hamburgers with tzatziki sauce, among many others. Thus, the guests were allowed to taste a great variety of products before the main courses. As starters and main course they presented a sugar-coat cod fillet on rosemary with tumbet timbale, and an exquisite white beef sirloin with potato terrine, capers, dried tomato and anchovies. To finish the banquet, a dessert based on a spectacular chocolate and yoghurt soup and a raspberry sorbet with pistachio crumble. Some exquisite and delicate Mediterranean dishes, with the distinctive hallmark of Marc Fosh Catering and its whole team. As always, counting on the highest quality products and presenting them in an innovative and original way. And, above all things, with flavours that make this catering keep its prestige and reputation in the international gastronomic sector.